More than 100 economists support the Tax Cuts and Jobs Act and say it will accelerate economic growth, increase wages, and lead to more jobs, according to a letter the economists wrote to members of Congress. Economists who authored the letter included those working at universities as well as those who worked at Office of Management and Budget, the Joint Economic Committee, and the Federal Reserve Bank. "Economic growth will accelerate if the Tax Cuts and Jobs Act passes, leading to more jobs, higher wages, and a better standard of living for the American people," the letter states. "If, however, the bill fails, the United States risks continued economic underperformance." The economists say the United States is falling behind in economic competitiveness because it has the highest corporate tax rate in the industrialized world, which is also 15 percentage points higher than the Organization for Economic Co-operation and Development average. "As a result of forfeiting our competitive edge, we forfeited 4,700 companies from 2004 to 2016 to cheaper shores abroad," the economists write. "As a result of sitting idly by while the rest of the world took steps to lower their corporate rates, we lowered our own workers' wages by thousands of dollars a year." 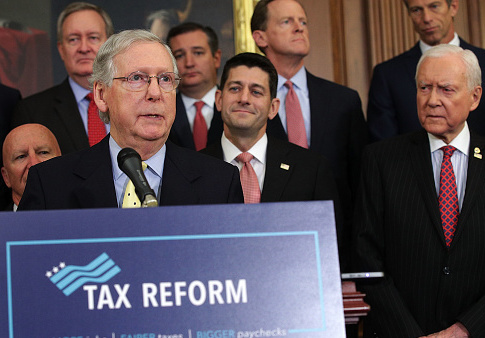 Economists say that passing comprehensive tax reform, which includes reducing the corporate tax rate to 20 percent, would "ignite" our economy and increase GDP growth by as much as 3 to 5 percent. "We firmly believe that a competitive corporate rate is the key to an economic engine driven by greater investment, capital stock, business formation and productivity—all of which will yield more jobs and higher wages," the economists explain. One of the economists authoring the letter, Douglas Holtz-Eakin of the American Enterprise Institute, says tax reform can lead to higher capital, which leads to higher productivity, which leads to higher wages and benefits for workers. "Better incentives (lower tax rates, the ability to write off investments, taxation only on earnings in the United States) increase the accumulation of tangible and intangible capital in the United States," Holtz-Eakin explains. "More capital raises productivity." "The final step is that faster productivity growth will translate into more compensation—wages and benefits—for workers," Holtz-Eakin says. "Capital accumulation, productivity growth, and living better: That is the case for tax reform." This entry was posted in Issues and tagged Republicans, Tax Reform, Trump Administration. Bookmark the permalink.